Today I want to write about a really cool species of bird, the ocellated turkey. These large birds grow up to 1.2 metres long and are much more colourful than the North American wild turkeys. Both the males and females have bright blue heads covered in red nodules. The males also have 4 cm spurs on their legs that they use to fight with each other. Ocellated turkeys have a wide ranging diet, including leaves, seeds, berries and insects. At breeding time, the males gobble and strut around the females to attract their attention. The females lay about 8-15 eggs and the chicks leave the nest and follow their mum a day after hatching. Ocellated turkeys are found in forests and clearings throughout central America, in Mexico, Guatemala and Belize. Their numbers are dropping due to hunting and habitat loss. 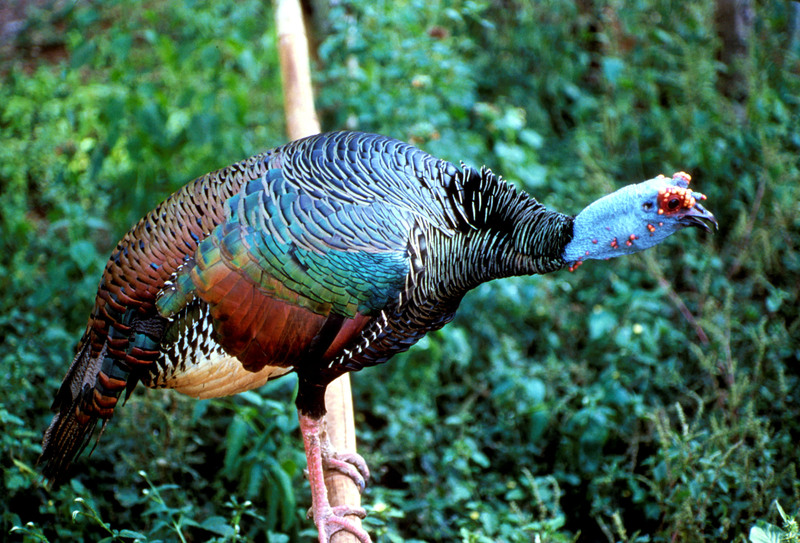 Are there any other interesting facts that you would like to share about ocellated turkeys?